Bob Dylan – 1974. Photo: Barry Feinstein. Last week in the New York Times, I read an obituary for Barry Feinstein, the famed photographer of rock stars whose images include album covers for George Harrison and Janis Joplin. Is it any wonder then that the most famous image of a rock star visiting the Phillips is by Barry Feinstein? This image of Bob Dylan visiting the The Phillips Collection was taken in January 1974 during his Before the Flood tour. 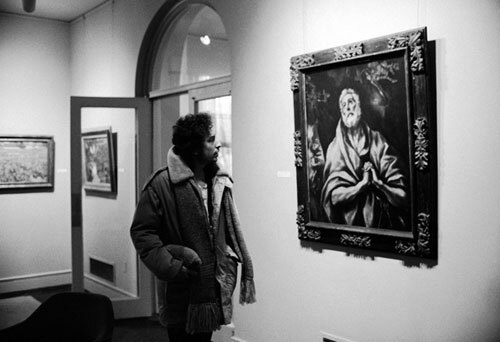 Prior to playing at the Capitol Center in the nearby Maryland suburbs, Dylan stopped by the museum and is photographed staring at El Greco’s Repentant St. Peter (c. 1600-05 or later). El Greco, The Repentant St. Peter, 1600 – 1605 or later. Oil on canvas, 36 7/8 x 29 5/8 in. The Phillips Collection, Washington, D.C. Acquired 1922. While one could make an analysis of the postcards Dylan purchased, I think the image of him and El Greco’s St. Peter is more interesting. El Greco paints Peter the moment the apostle realizes that he has denied Christ for the third time. He looks heavenward in search of redemption. Yet in Peter’s face there is little doubt that he will be forgiven by God and that he will be accepted into the kingdom of Heaven. After all, El Greco’s work dates from the Counter Reformation when church officials sought to show Catholicism as compassionate and forgiving. So amusingly Dylan, like St. Peter as portrayed by El Greco, seemed to act as if he always would be forgiven and accepted by his fans, no matter what he did or how mystified they were by the new and different versions of the old familiar songs he played on that tour. Dylan shares Peter’s divine anxiety, asking forgiveness, but assured that he will be redeemed.